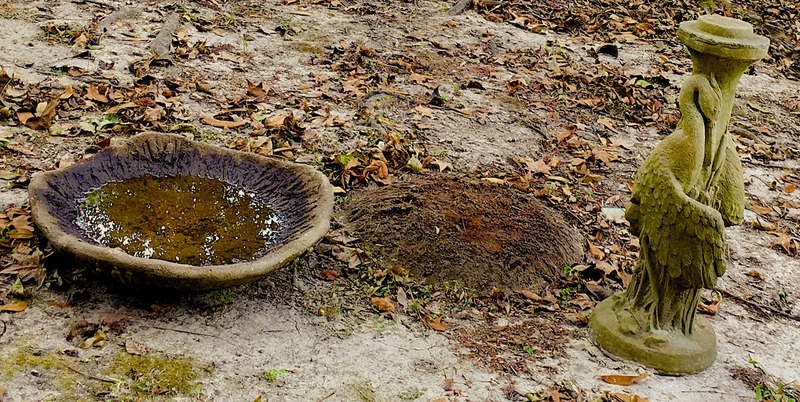 I’ve been in Louisiana for a week now, and I miss the sight of birds dipping in the bird bath in the front yard at Sewanee, Tennessee where I live part of the year. The bird bath in the backyard here in New Iberia has been upended because mosquitoes were laying eggs in the water. Shortly before I left Sewanee, we experienced a crucifixion of birds, a bird kill that occurred when more than 130 birds died after flying into the Sewanee War Memorial Cross and surrounding trees. A cold front moved through the area during that night, and nocturnal birds, flying lower than usual, were attracted to and became disoriented by the lights on the cross. Investigators said that migrating birds use earth’s magnetic field to help them navigate, and artificial light confuses them. The result was the massive bird kill. Kevin Cummings, staff writer at The Messenger (Sewanee’s “newspaper of note”), reported that after the birds died, Sewanee’s Plant Services changed the two lights at the cross, lowering the 2,000 watt bulbs to 400 watt bulbs. Cummings also reported that in the past, bird deaths had occurred on foggy nights, but the number of deaths hadn’t exceeded six or seven. In nearby Beersheba, forty-five minutes away at the Assembly United Methodist retreat center, 80 birds died the same night as the bird kill at the Sewanee cross. Migrating birds, if they’re flying low, are also drawn to brightly-lit windows of homes, but no mention was made of bird kills at residences. As I write, I see Dr. Sullivan, our bird bath tender, turning over the bowl of the upended bird bath after she has filled a large red pot with purified water to carry to the bath in anticipation of our feathered friends. However, a huge pile of ants, uncovered and now beside the bowl in the barren yard, may discourage bird visitors; it’s amazing how quickly nature takes over when house and yard are vacated for six months of a year. I expect the crows to return as they seem to know when I arrive and camp out in the trees next door, usually to bring me messages of good will. They were present at my leave taking from Sewanee, and I’m foolish enough, or superstitious enough, to think they follow me. Blue jays also hover around the house here; one year, a pet jay arrived and sat for months on a window sill, looking in and sometimes tapping on the window pane to attract attention. Both species think that I can interpret their songs and tapping, but I only sense their good will. delighting the soul like no other bird. P.S. A mockingbird just landed on the empty pedestal. 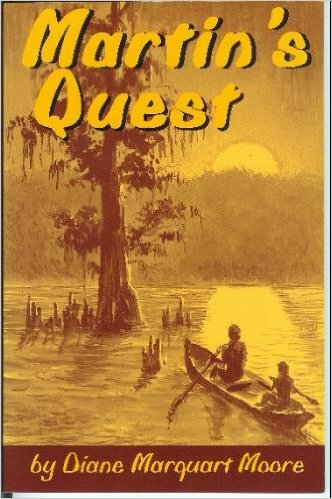 On a recent trip to the east coast of Georgia and Florida, we went into a bookstore at St. Mary’s Island, Georgia and picked up a book about the Okefinokee swamp entitled Okefinokee Album, a volume by Francis Harper and Delma E. Presley that documents the heritage of people who live in the “land of the trembling earth.” While leafing through a chapter that includes potions for “whatever ails you,” I became interested in the folk medicine cures suggested by old-time Okefinokee practitioners. The chapter reminded me of the research I’d done on folk medicine and traiteurs while writing a young adult book entitled Martin’s Quest. Traiteurs and other believers in folk medicine possess a veritable encyclopedia of cures for warts. The old-timers in the Okefinokee swamp suggested cures that didn’t include the element of prayer, but traiteurs in Cajun country often combined (and still do) home remedies with making the sign of the cross over the place affected by warts. In Martin’s Quest, Grandma Eulalie advises her grandson to take a piece of white bread, break it into two pieces and make the sign of the cross on his finger with one of the pieces, then feed the bread to his dog, Jean Sot. Chitimacha Indians in Charenton, Louisiana, from whom many traiteurs acquired some of their treatment practices, didn’t use the sign of the cross, but treated warts with fig juice during the time when the moon was shrinking. In the Okefinokee Album, folk healers treated warts in several ways. One healer advised the person being treated to take as many grains of corn as he had warts and tie them in a rag, then carry them off and throw them down where someone else would pick them up. A person would come along, pick up the rag and carry it back to the owner, and the warts would disappear. Another healer advised a person to slip over to his neighbor’s house and steal a dish, rub it on the warts, then throw the dish away and the warts would vanish with the dish. Some practitioners advised selling the warts that appeared on a person’s hand. The buyer would give the seller of warts a penny or a nickel, and the warts would disappear. The last treatment recommended by a practitioner was to bleed the wart, put the blood on a grain of corn, and give it to a chicken. The cure for cow warts was a treatment in which the cow’s owner would find a rotten piece of wood, hit the animal across the back of its neck so that the piece broke and fell on each side of the animal. While performing this feat, the owner would say, “Go away warts,” and the warts would disappear from the skin of the cow. Folk medicine is also still practiced in many remote areas of the Appalachians, but I haven’t come across a book on healers who live in the hills. However, I intuit that they have even more cures for warts. From what I’ve read and researched, people in the South must have been plagued by warts at one time! I was always told not to pick up frogs as they carried warts! I believe in prayer therapy and have also read many books about alternative medicine, none of which involve folk medicine, but I think that chiropractors, massage therapists, vitamins, acupuncture practitioners, have their place in this era of over-medication. I just finished a series of treatments performed by a chiropractor on an ailing back and leg and after six sessions, can now get through a night sans pain. I conclude with a bit of levity, a priceless, one-line recipe for curing stuttering recommended by a man named Jackson Lee and recorded in Okefinokee Album: Eat mockingbird eggs! A few days ago, I wrote a blog about a variety of birds splashing in clean water that my friend, Dr. Victoria Sullivan, had put in the bird bath in the front yard. She kept filling the bath with water from the reverse osmosis filtered water tap in the kitchen, but yesterday she decided to fill the bath via the garden hose as the process for filling was so much easier. But the result wasn’t the same! To our surprise, no birds appeared for their morning bath. We waited, checking hourly for the appearance of our feathered friends. By afternoon, we decided to change the bath, filling it with purified water again. Voila! One by one, the sparrows, cardinals, catbirds, nuthatch, titmouse and other small species took turns splashing in the bird bath until supper time, then departed before dusk for their home in the clump of blackberry bushes by the drive. “How did they know that the water was purified?” I asked Vickie. 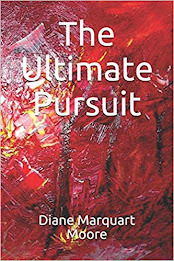 “Or maybe they’re just spoiled for me and my ministrations,” Vickie concluded. Dr. Sullivan is a botanist, not an ornithologist, so I consulted my old friend, Google, and the only answer that made sense for me was a simple one: birds don’t like the additives in ordinary tap water. In fact, some bird lovers relate that they’ve seen birds drinking from mud puddles before they’d drink from bird baths filled with ordinary tap water. Think of it – chlorine, fluoride, and other chemicals pollute water that even birds disdain; in fact, many of them become ill from drinking tap water. Unfortunately, there’s no water control board in the bird world, so they’re on their own about finding good water sources. There are many reasons for humans to watch the behavior of birds, including, it seems, that of learning good health habits. One cardinal was so grateful for the return of purified water, he dared to walk up to the herb bed by the front door and peek in. He was accompanied by a catbird who looked as if she wanted to engage in a flirtation, but the cardinal wasn’t playing. When the catbird turned her head, the cardinal lifted wing and flew off. “If St. Francis of Assisi could get birds to sit on his shoulders, perhaps we have a chance to befriend them,” I told Vickie. “I guess his stance of poverty means no allowances for purified water,” I said dejectedly. too much the warrior in his incaution. 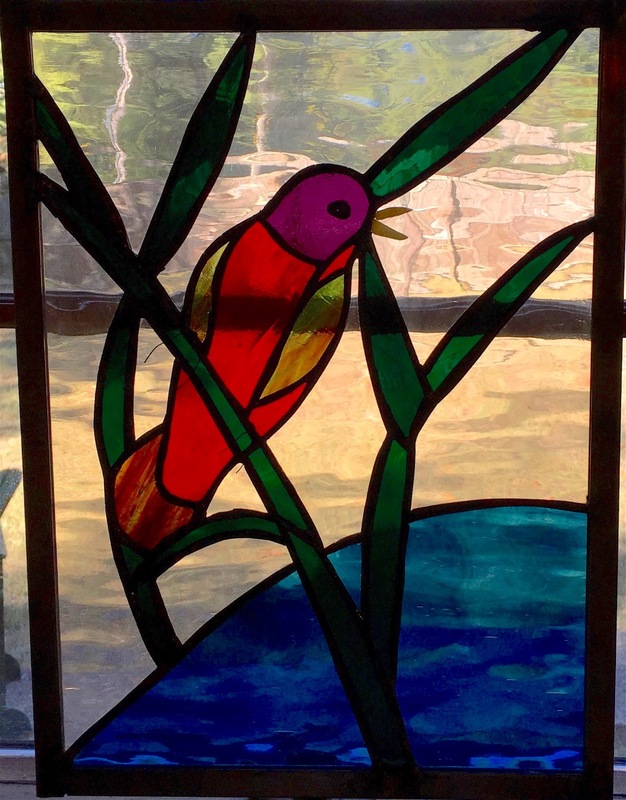 Glasswork of Painted Bunting by Karen Bourque, glass artist, Church Point, Louisiana. 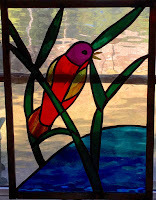 Photographed by Dr. Victoria Sullivan as it hangs in a window of our Sewanee house.